Or maybe just no blog post today. Posted in Uncategorized and tagged apple, iphone, iphone 3g, iphone 3gs, mac. well, you cant check your twitter updates until you unlock the home screen. Just being efficient. I can totally relate to this, except I don't have the iPhone yet. I can hear the choirs sing. I think you have a new T-Shirt idea there. its sort of a disney princess moment. Meaning I would shove my hand through that guys face to get one. the more faces youare willing to punch through to get something, the more you deserve it. I think it would have been interesting if you had plunged your fist into his chest through the box and instead of pulling out his still beating heart it was the iPhone with a beating heart app. unfortunately, it rarely means you'll actually get what you want if you do go out and start punching through faces willy nilly. Love the Doe's eyes. Quiet eyes. Deep eyes. Yeah this is me pretty much any time I order something for my computer. Or do I see some sadness for FedEx guy in Bambi's and Thumper's eyes? they arent sad. they get to finish him off. It's a Woodland Critter iXmas! 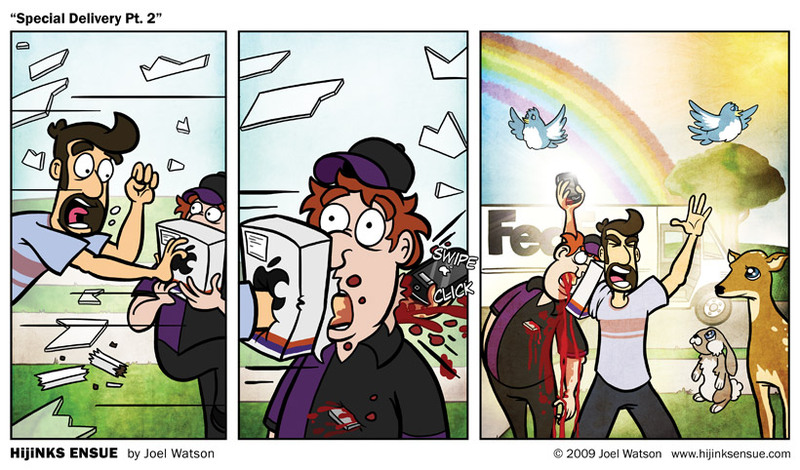 Now lets bathe in the blood of the FedEx man!! Bambi is ashamed that you got blood on your shiny new iPhone. one of the new features is that blood wipes clean very easily. well, now I HAVE to get one. Panel 2 is really well done. Nice work Joel! Hilarious! Great work as always. Were the birds in the 3rd panel supposed to look like the Twitter icon, or is that coincidence? coincidence. They were more "snow white" than anything. I call shenanigans. You'll ruin the battery if you use it right away, right? I've been laughing out loud for five minutes now. glad to hear it (the news, not the laughter. If I could hear the laughter then you would be in my office and we would have a new problem to deal with). Love that Joel has not even withdrawn his arm from the FedEx guy's throat/head/brain in his pose of triumph in panel 3. Lovely! it snaps into my chest like Tony Starks Arc Reactor. but you forgot the unicorn tears! 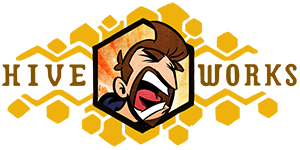 The third panel is very Penny Arcade'esque, very nice. Last panel: Best. Panel. Evar. (the expression on your face is priceless) By the power of Greyskull! YOOOOU HAAAAVE THE POWEEEEEER! I suppose the moral of this story is, when delivering iPhone, always hold the box off to one side, away from your body, rather than directly in front of yourself? I'd like to think that the birds were up your sleeve ala Gob Bluth. This is one of my favorite comics yet, bee-tee-dubs. now i get it! i had no idea what was going on. not the best comic around, though. It is, actually. The best comic around, that is. oh my god…this is possibly the greatest two parter i have ever seen. I like to think that glass shard to the heart rendered him unconscious just before your hand was thrust through his face so he didn’t suffer. Though, of course, you probably severed his brain stem which would pretty much kill him instantly.